Taste test: These were possibly the crunchiest potato chips we've ever tried. At first glance, they looked like typical kettle-cooked chips, such as Cape Cod chips, but with just one bite it became clear that these were slightly thicker and had an extra order of magnitude of crunch. 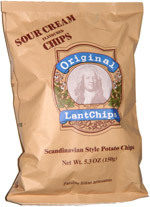 The sour cream flavor was mild but good, and there was lots of nice potato flavor, kind of like a baked potato. Smell test: Kind of like sour cream.